The Indian board (BCCI) will suggest to the ICC that it should walk out of the World Anti Doping Agency (WADA) umbrella and opt for its own cricket-specific anti-doping code. The BCCI feels that this is the only possible solution to the deadlock over this issue after its players refused to abide by a clause in the WADA code that requires them to reveal information about their whereabouts three months in advance. Cricinfo has learnt that the BCCI will propose this solution, which was formulated after a series of discussions among senior Indian board officials over the last week, possibly as soon as the next meeting of the ICC's executive board in early October. 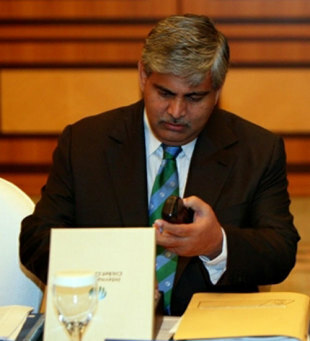 The Indian board is confident of getting the support of other major national boards on the issue at the ICC level and expects its suggestion to be ratified. On Sunday, the BCCI's decision-making working committee resolved to back its players and reject the 'whereabouts' clause in the amended WADA code, which was implemented by the ICC from January 1. This contentious clause requires cricketers in the ICC's international testing pool to reveal before every quarter details of their location for an hour every day for the next three months to facilitate out-of-competition testing. The 11 Indian players in the pool have expressed security concerns in this regard, especially because some of them such as Sachin Tendulkar and MS Dhoni face threats from terrorist organisations. The BCCI has said that this clause, which prescribes severe penalties for defaulters including a ban for up to two years, also violates privacy guarantees provided in the Indian constitution. Other international cricketers in the testing pool from other countries had also expressed privacy and practicality concerns about the clause but agreed to abide by it within the July 31 deadline. The BCCI and its players are clear that though there should be no compromise in the fight for a clean sport, the ICC needs to adopt a cricket-specific code where testing is done only during the 10-odd months every year when the game is played at the international level. As a first step, the BCCI has suggested that instead of players revealing their whereabouts information in advance, the ICC or WADA testers should contact the Indian board which will ensure that the player will be available within 24 hours at the required location for testing. But the WADA has already made it clear that no exemption to the code will be granted as 571 sporting bodies across the world abide by these norms. If the ICC board eventually rejects the WADA code, cricket cannot be part of competitions such as the Asian Games and Olympics that are organised by the International Olympic Committee (IOC), which has set up and promoted the Lausanne-based agency as an independent anti-doping watchdog. Such a move will also result in ICC losing the opportunity to use the Olympic movement as a vehicle to globalise the game, which will then be in danger of being further alienated on the world stage. However, a senior BCCI official who was involved in recent internal board discussions on the issue told Cricinfo that India's position was that its players need not submit to the "ridiculous and draconian" whereabouts clause. India will also reiterate its position that has been expressed at previous ICC board meetings that cricket is under no compulsion to participate in competitions under the Olympic movement. "Cricket does not need this ridiculous and draconian measure," the official said. "The only solution now is for ICC has to walk out of WADA and opt for a cricket-specific code that will put in a place a testing programme for about 10 months in a year when the game is played at the international level and probably another month during various training camps." The BCCI official also claimed that the question of cricket becoming an Olympic sport has never found favour within the the ICC board, which consists of senior representatives from 10 full member boards including India. "What's the need for cricket to become an Olympic sport?" the official said. "Contrary to public perception, the ICC board has never felt the need for such an inclusion and it has previously rejected proposals in this regard. India and other major boards like England have been against any such move." Apparently, the BCCI has also realised that the ICC's decision in 2006 to become a WADA signatory was "not a wise move"; as a member of the ICC board, India was party to that decision. "In hindsight, the ICC decision in 2006 to be a WADA signatory has turned out to be a foolish one," the official said. "It must be made clear though that the BCCI and its players are not against anti-dope testing and are keen to ensure that the sport remains clean. It's only the path to that goal that is being questioned. The WADA is an independent body set up by the IOC and cricket is under no obligation to be part of that umbrella." The BCCI is also clear that cricket cannot be clubbed with other Olympic sports in which medication can play a decisive role in determining performance. "Cricket is not like most other Olympic sport such as athletics," the official said. "Skills are paramount in cricket and muscle-enhancing and endurance-boosters do not count for much when it comes to performance. There is the odd exception but even in those cases, system abuse has only led to an early end to players' careers." The BCCI official said that the ICC board could also discuss the issue sooner, possibly over teleconference, if it feels that the matter needs to be addressed before the ICC Champions Trophy starting on September 25. Concerns about the 'whereabouts' clause in the amended WADA code is not a cricket-specific issue and has been treated as a matter of concern in other sports, particularly team sports such as football. FIFA, football's governing body, is still not completely WADA-compliant due to similar concerns and has suggested that only players they deem as high-risk be included in the testing pool. Tennis stars such as Rafael Nadal and Serena Williams have also spoken out against revealing whereabouts information in advance. However, Roger Federer has defended the system, and has been quoted as saying: "You're not going to catch them by ringing up and saying, 'Look, I'd like to test you maybe in two days.' The guy is cheating and they are smart, right?"